Nokian Tyres’ new Hakkapeliitta LT3 on a Dodge Ram 1500. Amid the snow-capped mountains of Cooper Mountain, Colorado, Nokian Tyres introduced the Hakkapeliitta LT3 winter tire for 4×4’s and pickups to tire distributors, dealers and members of the media at the end of January. The tire, which replaces the Hakkapeliitta LT2 launched in 2012, features updated technology in the tread and compound. Hans Dyrhman, Nokian’s director of marketing, said the tire also features Arctic Stud Technology, what the company says is the world’s first stainless steel stud innovation tailored for heavy-duty use. Tire dealers and distributors tested the tire and drove on other members of the Hakkapeliitta family of winter tires to better understand how Nokian’s winter tire technology is translated throughout their product line. 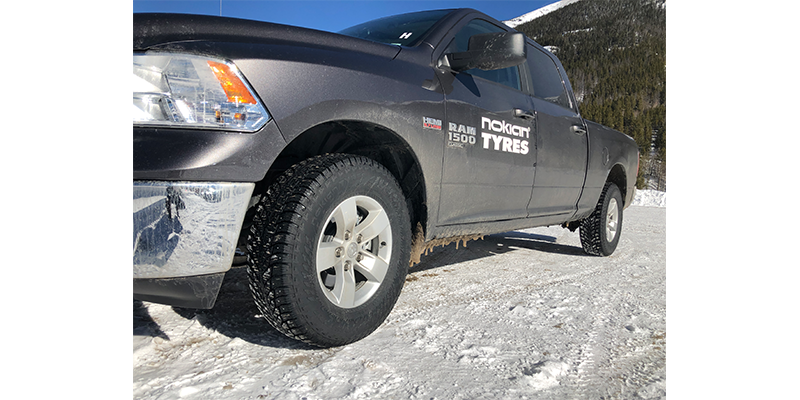 Five testing areas were set up on the grounds of Copper Mountain Resort with participants testing the LT3 on a Dodge Ram 1500 on a winding snow course that featured sharp turns and deep ruts where drivers could push the tires to the limit. Other testing areas included: a cone slalom course, in which drivers could compare the handling of Nokian’s WRG4 SUV on an Audi Q3 to that of the OE tire on the same vehicle; an acceleration and braking track, where drivers tested the Hakkapeliitta R3 SUV on an Audi Q5; a lateral traction course, where drivers tested the Hakkapeliitta 9; and an off-site ride in a Tesla Model X, which allowed drivers to feel the rolling resistance of the Hakkapeliitta R3 SUV. The LT3 is the first product that Nokian’s engineers designed at its headquarters in Finland that works both with and without studs. It was tested at its famous “White Hell” course in Finland and around the world in other winter climates, said Steve Bourassa, Nokian’s product manager. Nokian Tyres’ Hakkapeliitta LT3 in the elements. The tire features an increased tread depth with a stiff mid area, which actively manages high wheel loads and maintains durability in various road conditions. It has a tear- and cut-resistant Arctic Grip tread compound developed specifically for heavy-duty use that contains more high-quality silica for wet traction, improved tread wear and lower rolling resistance. Its tread features an aggressive pattern that removes snow and slush between the tire and the road. A few features of its tread include: 3-D locking sipes and biting edges for enhanced traction; snow claws between sipes for better acceleration; blade grooves that go toward the outside of the tread for slush planing resistance and to clean snow out of the tire; plus a shoulder area with comb sipes for enhanced stiffness and handling. Similar to its other SUV and light truck products, Nokian incorporated its Aramid Sidewall technology into the LT3, which feature strong, synthetic Aramid fibers that make the tire resistant to impacts and cuts. It also features a Winter Safety Indicator (WSI) patented by Nokian, which displays the percentage of tread depth that remains. The snowflake symbol remains visible to a groove depth of four millimeters, a signal to customers that they need a new set of winter tires. One of the most unique features of the new Hakkapeliitta LT3 is its new stainless steel stud technology, which resists corrosion from salty roads. The new 16/32-in. 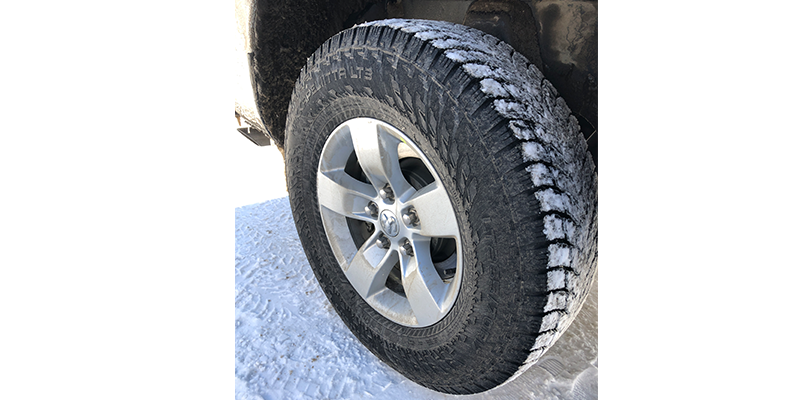 studs in the tire are different shapes on the inside and outside of the tread and are denser, which help the tire dig into ice better, Dyhram said. The LT3 comes with an increased tread depth of 16.5/32nds and models with a higher load index (>121) have a tread depth of 17.5/32nds. The comprehensive and modern size selection of the Hakkapeliitta LT3 covers 16 products from 16 in. to 20 in. with a speed rating Q (160km/h) and will become available to North American consumers in fall 2019. The company also plans to release the tire in the Nordic countries, Central Europe and Russia in the near future. The LT3 will be available with both factory studding and as a non-studded variant.